Det Kongelige Operakor, Det Kongelige Kapel / Thomas Søndergård. Operaen, Store Scene, Copenhagen, Denmark. Sunday, March 12th, 2017. Attending a show at the Copenhagen Royal Theatre’s main opera venue is always a privilege. Walking over from Nyhavn around the back of the theatre and to see Amalienborg palace on the other side always feels so special. There’s something genuinely pan-European about Il viaggio a Reims with characters from all over Europe coming together to celebrate a coronation. 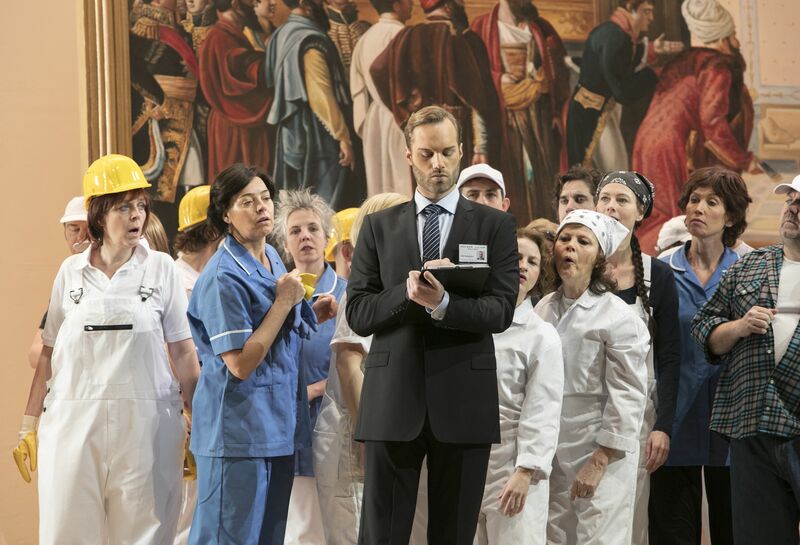 The inclusion of God Save the King in the final scene reminds us that England has always been part of Europe – despite what its current short-sighted political leadership says. Il viaggio has always perhaps been a difficult work to pull off. 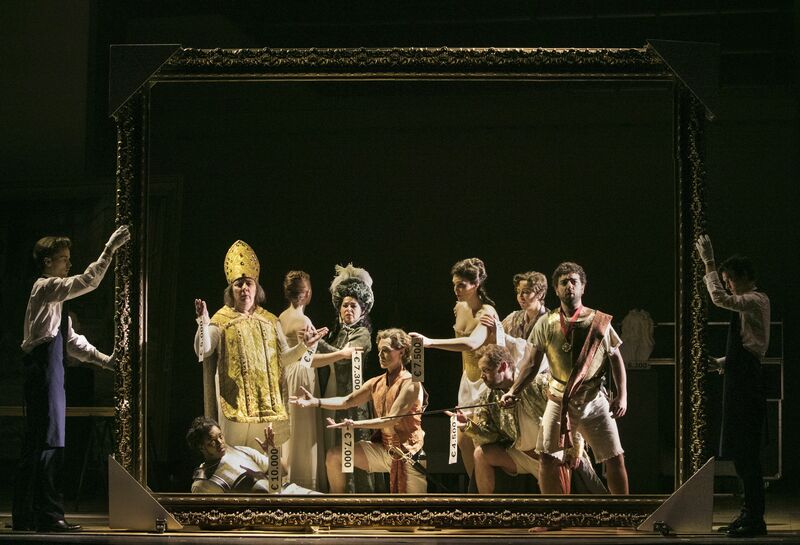 With a huge cast, there’s a tendency perhaps for it to feel like a sequence of numbers, however fluently composed (the ‘gran pezzo concertato’ with 14 parts is a tour de force). The production’s director, Damiano Michieletto, had a quite an innovative solution to this issue. Rather than provide a straight reading of the text he gave us something very different. Set in an art gallery, the staff are seen preparing for a vernissage. 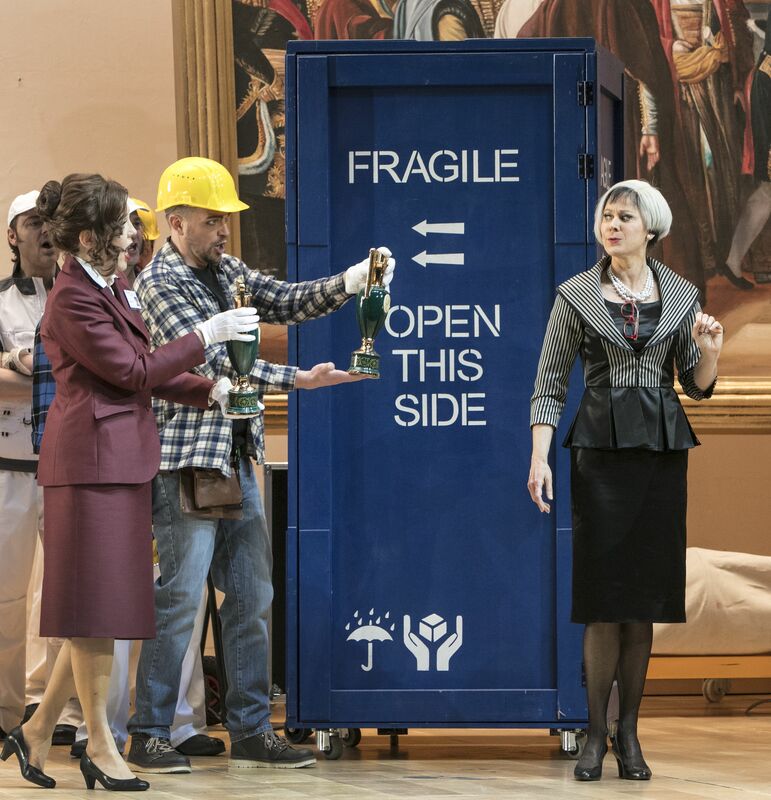 As the show develops, characters emerge from boxes and unwrap themselves from cellophane to take on a life of their own. In a way, the setting of an art gallery makes the staging feel almost like an art installation, an experience to be taken rather than a conventional linear narrative. Yet that doesn’t mean that what we get is abstract. 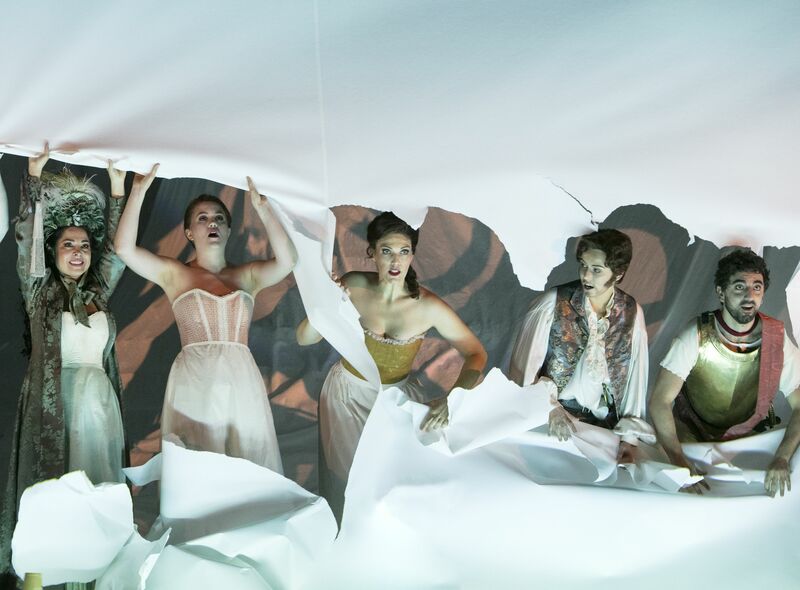 On the contrary, Michieletto, here assisted by revival director Meisje Barbara Hummel, gives us flesh and blood characters: the Contessa di Folleville is a pill-popping shoe obsessive, and Belfiore and Corinna are ardent young lovers. These are characters who we don’t know whether they are real or imagined. At first the gallery owner, Madama Cortese, and her staff seem real but as the show develops we begin to question that for ourselves. On paper the concept might sound abstract but in reality it’s anything but. In a way, it’s easy to make the difference between the real and imagined characters about class relations but I’m not sure that is the point. 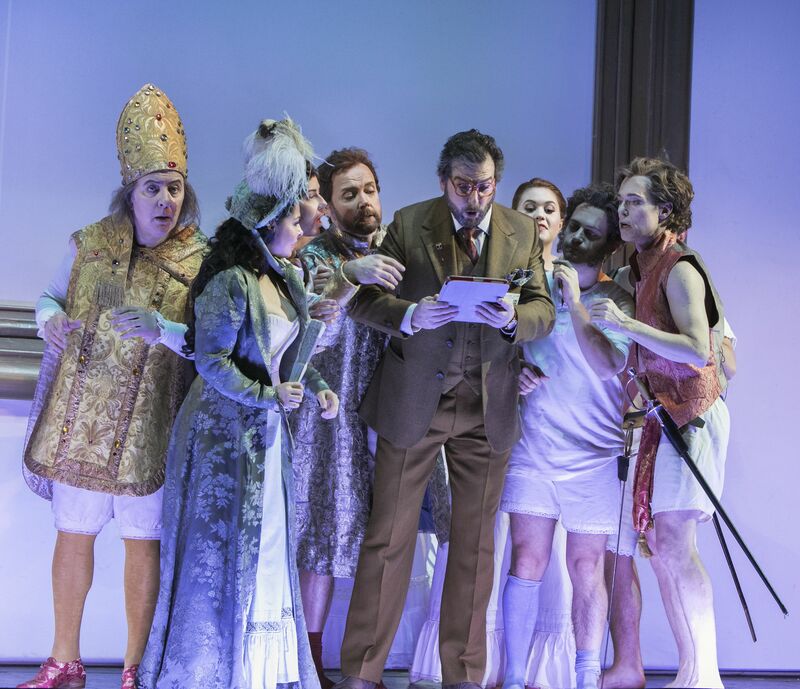 I think what Michieletto succeeds in doing is transforming a plot that can seem paper-thin into something that mines the comedy and human emotions in the plot and makes it a memorable evening that genuinely lives. He transforms the notes into comedy, whether in singers’ excursions to the stratosphere or in the coloratura. Yet I think his central message is a most inspiring one and that is the centrality of art to our existence. 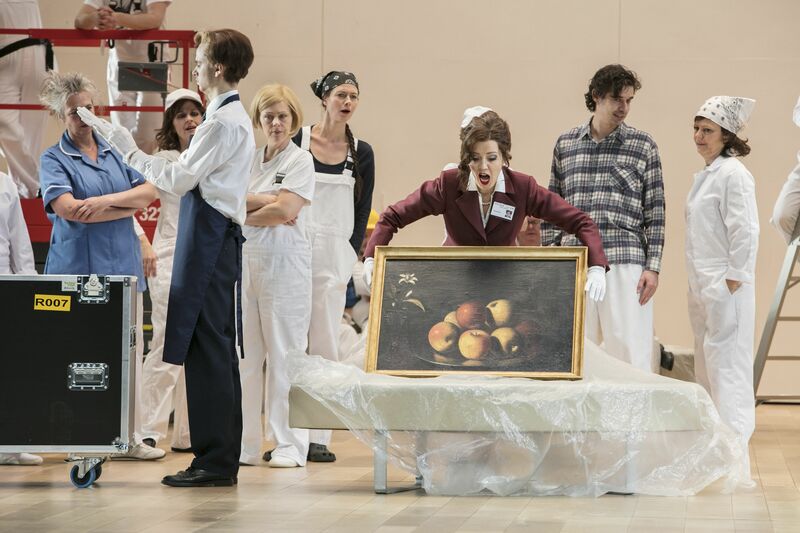 As we see characters coming to life in paintings – and at the end becoming one – we are reminded that all art is a re-creation, whether in the individual experiencing it or, especially in opera, in those creating it there and then for us. We live with art and it lives with us. I found it a most moving and uplifting message. Of course, the performance might not have worked its magic had it not been musically sound too. Key to its success was Thomas Søndergård’s sensational conducting. Having most recently heard him lead the Deutsche Oper world premiere of Edward II I was astonished by his fluency in Rossini. Attack was crisp with strings playing with minimal vibrato. Tempi were swift with an unerring sense of pulse and rhythmic impetus that drove the performance along fizzingly. The orchestra played extremely well for him, especially the brass who virtuosically coped with those swift tempi. The chorus also handled it well although the ladies’ pitching wasn’t always unanimous; they did, however, sing with theatre-filling amplitude. In Rossini there really is nowhere to hide for the principals. The solo singing was always honourable and in many cases much, much more than that. There was a genuine sense of ensemble to this cast that made it feel absolutely irresistible. Anke Briegel was a lovely Corinna singing her beautiful numbers with long lines and an impeccable sense of style. There’s a slight edge to the tone bordering on acidity but there’s also a nicely crystalline top and genuine evenness throughout the range. Elisabeth Jansson was a tremendous Marchesa Melibea with a dark, silky mezzo with good reach and agility as well as some neat staccati. Rebeca Olvera gave us a stratospheric Contessa di Folleville. With a distinctive fast vibrato the voice sounds like champagne, a bottle rather than a magnum, but her ease on top was remarkable adding some dizzying ornamentation in her big set piece. Henriette Bonde-Hansen’s Madama Cortese also showed genuine fluency in her coloratura with solid musical instincts although the sound didn’t quite carry through the house in the lower part of her range. The gentlemen were also very satisfying. Levy Sekgapane is a new name to me and he is a very exciting singer. The owner of a light and high-lying tenor, he also offered some stratospheric embellishments and effortless ease in the florid writing. A name to watch certainly. Gert Henning-Jensen demonstrated some outstanding breath control as Belfiore as was well as staggering ease at the top of the range. I was impressed by Davide Luciano and Mirco Palazzi as Don Alvaro and Lord Sidney respectively, both demonstrating remarkable negotiation of those register-crossing intervals and equally fluent musicality and negotiation of their florid writing. Nicola Ulivieri’s Don Profondo was a congenial presence but I found the voice somewhat soft-grained and I wish he had sung his aria more off the text – the words weren’t always ideally clear. José Fardilha camped it up magnificently as the Barone di Trombonok, the role sung off the text in a characterful bass-baritone. I was also struck by Teit Kanstrup’s handsome baritone as Antonio, certainly a voice I would like to hear again. This was a splendid afternoon in the theatre given to us in a life-enhancing production that cofounded all expectations and reminded us of the centrality of art to our culture. The act of experiencing as an audience member is in many ways as much a part of the process of performance as the art of re-creation. With conducting that brought the work to fizzling life and an ensemble performance that was full of joy, this was an irresistible afternoon in the theatre and just the medicine that one needs in these dark days. Certainly, if you are anywhere near Copenhagen do try and get to see it.